Simply send us an (if you like empty) email to newsletter (AT) volcano-adventures.com. 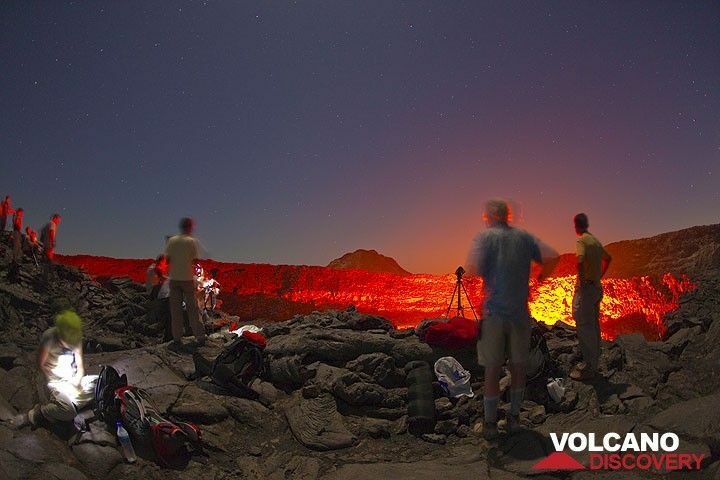 Although visitor numbers increased significantly over the past years, the active lava lake of Erta Ale volcano and unique colourful scenery of Dallol’s hydrothermal fields remained more risky travel destinations due to their proximity to Ethiopia’s border with Eritrea. The decades long violent conflict between the two countries included the killing of 5 and kidnapping of 2 tourists visiting Erta Ale in January 2012. Following this deadly incident new safety measures involved military presence at all times on Erta Ale’s summit as well as armed Afar escorts for anyone traveling in these parts of the Danakil depression. Increased security made adventure travellers return to this one-off destination which recently saw a large increase in visitors as well as documentary coverage. The region will undoubtedly become even more popular now that the 8 July 2018 peace agreement between Ethiopia and Eritrea unexpectedly made an end to one of Africa’s longest running conflicts. The historic background for this up to now troubled border zone is that Eritrea used to be a province of Ethiopia before it declared its independence in 1991, after 30 years of war for independence. A 1993 referendum resulted in a huge voting turn-out and vast majority in favour of Eritrea’s independence so that the new state was established and entered the United Nations. However, the exact location of the international border could not be agreed upon and gave rise to armed conflicts which culminated into the 1998 – 2000 Eritrean-Ethiopian war that costed the lives of tens of thousand people and displaced half a million. The UN facilitated 2000 peace agreement was however never fully carried out as Ethiopia did not hand back disputed territories to Eritrea. Both sides acted out numerous armed aggressions over the past 18 years, the most recent one being a one-day battle between their armies in June 2016. It is thanks to Ethiopia’s new prime minister, Abiy Ahmed, that Africa observers all around the world are astonished with this unforeseen reconciliation of the two sworn enemies. Since the start of his term in April 2018, the 41-year young politician has launched a number of political and economic reforms to bring about major changes towards a more democratic and reformed Ethiopia. He is the first Oromo prime minister, coming into place after three years of growing opposition from the ethnic majorities against the Tigray minority that ruled the country for decades using a centralised economic model and political repression. Besides pardoning thousands of political prisoners, ending the state of emergency (which was declared to suppress widespread opposition), lifting bans on websites and media, firing controversial politicians, ... he also undertook successful steps towards peace with neighbouring Eritrea by withdrawing from the disputed territories assigned to Eritrea in the 2000 Algiers agreement. Ethiopia is Africa’s second most populated nation and one of its fastest growing economies. The only African country to have been just briefly colonized (by Italy from 1936 to 1941) it preserved the rich history and varied culture of its large territory that includes different climates and topography, ranging from the Simien Mountains (up to 4500 m high) to the Danakil Desert (down to 120 m below sea level). With 9 recognised UNESCO World Heritage Sites and another 5 sites on the tentative list, Ethiopia has a lot to offer to tourists, travellers and explorers alike. This was reflected in growing numbers of visitors since 2000 and the 2015 nomination of Ethiopia as the world’s best tourist destination by the European Council on Tourism and Trade. Despite this growth, Ethiopia’s travel potential was hampered by the 10 km exclusion zone along the Eritrean border and growing political unrest of the last few years. The fresh take on politics and economy along with peace and cooperation between Ethiopia and Eritrea will undoubtedly change this for the better, creating a safer and more stable climate for travellers from around the world to come explore Ethiopia’s treasures. Not the least among these being the active shield volcano of Erta Ale with its active lava lake and since January 2017 ongoing flank eruption; the acid ponds, colourful deposits and hydrothermal sources of Dallol; the vast salt deposits and saline lakes of Afdera and Assale; ancient traditional camel caravans; the UNESCO world heritage site of Lalibela’s rock hewn churches; and many more which are all included in our 14 days ‘Desert, salt and volcanoes’ expedition!